Hindi & Sanskrit Teachers Vacancy in High & HS Schools in Dima Hasao: Last Date 15-07-2017. - Jobs4NE : Jobs in Assam and North East India. 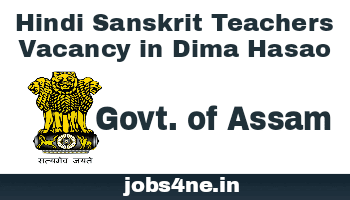 Hindi & Sanskrit Teachers Vacancy in High & HS Schools in Dima Hasao: Last Date 15-07-2017. Applications are hereby invited from the citizens of Assam having TET and B.Ed. qualifications for filling up the vacant sanctioned post in the subjects of Hindi/ Sanskrit in the following schools as shown below. This has the approval of the Principal Secretary, N.C. Hills Autonomous Council, Haflong vide his letter No. AC/SIU/I/IS/2016-17/93 Dtd. 30.05,2017. Last date for receipting of application: 15-07-2017 till 04.00 pm. Date of screening test will be held: 17-07-2017. Job Location: Dima Hasao, Assam. Name of the post: Hindi & Sanskrit Teacher. 1. Maibang Higher Secondary School: Sanskrit Teacher. 2. Kepre High School Hindi Teacher (Sr.). 3. Thanalambra High School: Hindi Teacher (Sr.). 4. Manderdisa High School: Hindi Teacher (Sr.). 5. Leiri High School: Hindi Teacher (Sr.). 6. Public High School, Harangajao: Hindi Teacher (Sr.). 7. Boro Arkap High School: Hindi Teacher (Sr.). 8. Thaijuwari High School: Hindi Teacher (Sr.). 9. Sangbar High School: Hindi Teacher (Sr.). 10. Mahur Higher Secondary School: Hindi Teacher (Sr.). 11. Gunjung High School: Hindi Teacher (Sr.). 12. Kharthong High School: Hindi Teacher (Sr.). Age Limit: Not less than 21 years and not more than 38 years of age as on 01.01.2017, however age relaxable upto 5 years in respect of ST(H)/ ST(P) and O.B.C. candidates. Qualification: Graduate with TET and B.Ed. Scale of pay: Rs. 14,000-49,000/- + Grade Pay Rs. 8,700/- p.m.
How to Apply: Applications alongwith all educational certificates and other testimonials if any and will be received by the Head of the Institution where the candidate desires to apply, upto 4.00 p.m. of 15.07.2017. The date of screening test will be held on the 17th July/2017 in their respective Institutions from 11.00 A.M. onwards and no separate call cards will be issued in this regard.